The photographs and descriptions were done by Terri Meyer Boake B.E.S. B. Arch. M.Arch, Associate Professor School of Architecture University of Waterloo. They may be copied for educational purposes. Please give credit. These images may not be reproduced commercially without written consent. 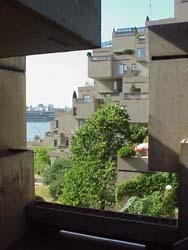 HABITAT 67, Expo's controversial housing exhibit, has been called a lot of things since it started to shape up in Montréal but Anthony Peters and his family are among the very few who can call it home. And how sweet it is -- mice or no mice. Peters, a young Montréal architect, has lived at Habitat since May with his wife Gwyneth, son Miles, 5, and daughter Lynette, 3. "We figured 1967 was going to be a year to remember, especially in Montréal," he explains, "so why not do it up right by living right here on the Expo site." If you are among the millions of people who have visited Expo, you have likely seen Habitat's way-out mass of grey concrete not far from Expo's main entrance, Place D'Acueil. If you haven't you should know that at Expo, where a lot of things are pretty weird, Habitat is one of the weirdest of all. Overall massing of Habitat -- stacked precast concrete boxes. 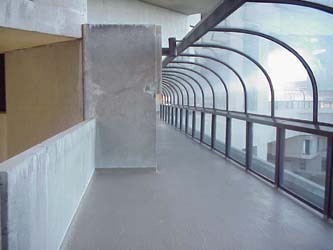 The upper level walkways are partially enclosed to protect from snow and inclement weather. The structure is 13 levels high. The top 11 are the houses; the ground level is the parking level for 175 cars and the lowest level is for building services. Three elevators serve major pedestrian streets at the ground, sixth and tenth levels. The streets are open-air but are sheltered off the St. Lawrence river by a glass balustrade and a curved transparent plastic screen. The whole thing cost $22,195,920. 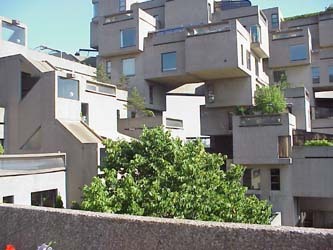 Habitat is the brainchild of Moshe Safdie, 28, who came to Canada from his native Israel about 12 years ago. He believes high density living can and should be a lot more fun than it is in today's conventional, box-like apartment buildings which he considers "unfit for human consumption." "The average family wants privacy, its own garden, parks, sunlight, fresh air and, equally important, a sense of identity with its home," he said. "Habitat is a complete environment because it has these requirements." But what is it really like to live there? When the Peters family moved in they planned to stay only for the duration of the fair -- six months. They wanted to be close to Expo and more important, they wanted to know what Habitat had to offer. Soon after they moved in they decided it had a lot to offer. They loved it and now they don't want to move. 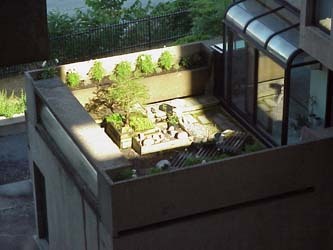 View down from walkway onto a private terrace. 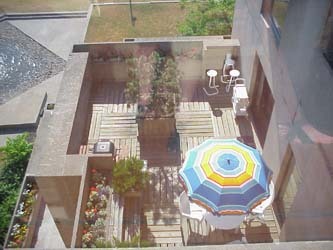 View down from one terrace to another unit's terrace. Their decision to stay has a lot to do with the fact that they love Habitat's weird, futuristic environment but it also has to do with Anthony Peters and his dislike for gardening. In 1960 he purchased 17,000 square feet of wooded land in Préville on the south shore of the St. Lawrence river near Montréal and built himself a large split-level home complete with six bedrooms, three-and-a-half bathrooms, recreation room, the works. He and Gwyneth then awaited the birth of Miles and had sweet visions of the good life among their 100-year-old elms. In no time at all, however, Anthony Peters discovered his idea of the good life had nothing whatsoever to do with cutting all that grass and caring for all those flower beds. "It was too much like work. We had never lived in a big house and we were not ready for all that space. The maintenance was a menace. We liked the greenery but we didn't enjoy cutting it. All in all I guess we realized we were more urban-minded than we had known." Then along came Expo and Habitat -- Moshe Safdie's idea of the good life. The Peters, up to here with grass, trees and flowers, decided to give it a try. 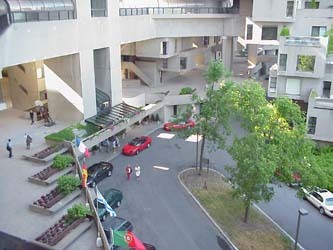 View from an upper level to the main entrance and drop off point. 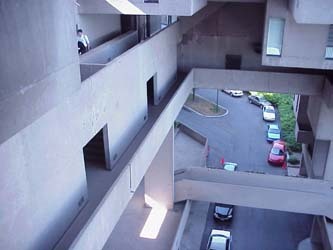 View down from an upper level to the central car corridor and pedestrian bridges that cross over. "I was a little worried about it all," confessed Mrs. Peters. "After living in that big house I couldn't imagine where we would put things. I still don't know what to do with our grand piano." Right now their lives are very hectic because they are living on the site of the greatest show on earth -- Expo. Everybody wants to visit them even though visitors have to pay $2.50 at the Expo entrance before they can come calling. "And I have to pay baby-sitters and cleaning ladies an extra $2.50 every time I need them," said Mrs. Peters. "It gets expensive." Especially expensive if you pay $470 rent each month as the Peters do at Habitat where rents during Expo range from $330 to $750. But friends don't seem to mind paying their way in. "Everybody gets a kick out of coming to Habitat and we enjoy it. After all that's why we moved in. Funny though how as soon as we got here the members of the car club I belong to decided it was my turn to host our monthly meeting," Mr. Peters said. The Peters live on the ground floor of Habitat away from the exhibit section through which thousands of wide-eyed visitors flock every day. They decided on the ground floor because of the children. "It is designed for family living but we just don't feel safe about letting the children go up to the higher levels. They have the run of the ground floor and feel they own it all but we don't let them go to the playground up near the top," said Mrs. Peters. 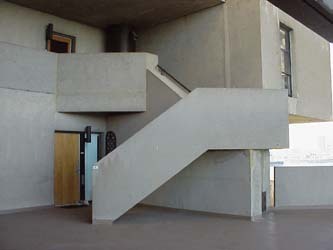 The exposed concrete character of the interior spaces. Views from the interior to various terraces of the units. The unit they live in overlooks the St. Lawrence river but Mrs. Peters does not worry about the children falling in the water which is very fast in back of their house. "They can understand the danger of water. They don't get too close," she said. Furthermore, the house has several windows that give them not only a wonderful view of the river but Miles and Lynette can also look out of their bedroom windows and see the pavilions on Notre Dame Island, the minirail, Expo Express, helicopters and hovercraft. "It's all pretty wild," Mrs. Peters said. "A bit 1984, you know. All sorts of things to see. It makes us feel very alive." It is also an ideal way to see a world's fair. Nearly every day Gwyneth takes the children out to see a pavilion or two and because they know they are going to be there for the duration there is never a need to rush. When they get tired they simply come home. Mrs. Peters enjoys watching Expo visitors and their reaction to Habitat. "Every so often I will hear someone say that it is just an experimental exhibit and that nobody really lives here. I always speak up and tell them I live here and that it is wonderful." A lot of people say they find Habitat's mass of concrete rather grey, gloomy and cold. But not the Peters. Mr. Peters said he gets a different feeling every time he looks out a window. 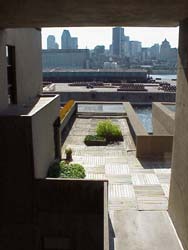 Looking out from the interior accessway towards the river and Montréal downtown beyond. View out to the river beyond. "The sun is constantly casting shadows on it and the effects are very interesting. It is always changing as the sun moves. It's like living in the middle of a Henry Moore sculpture. You get a new view at every turn." They also enjoy the spacious patio that overlooks the river. You can get to it from either of their bedrooms and from the living room. It is a wonderful place to entertain guests. 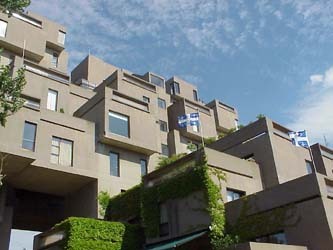 Despite its high-density design they find they do identify with their unit as Moshe Safdie predicted. "We can walk right around it and feel it belongs to us. You can't do that in an ordinary apartment building," said Mrs. Peters. They are not nearly as fond of the arrangement of some of the windows. Those in the master bedroom, bathroom and hall could have been located to insure more privacy. And it is dusty. "There is a lot of concrete around here and they did not put any sealer on it," said Mrs. Peters. "I think that was a mistake. With two children running around all the time there is fine layer of dust on everything just about all of the time. You no sooner clean it up than it is dusty again." Space is another concern. Bedrooms are small and so is the laundry area. And after living with three-and-a-half bathrooms they find it difficult getting by with just one. But these are minor problems to the Peters who are fast learning to cope with the ways of living in a development that is as new as tomorrow -- or maybe the day after. 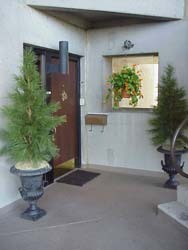 Privatization of the character of the front entry to a unit. 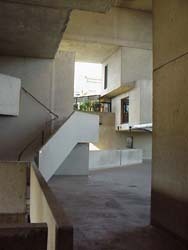 Access to unit entry by dedicated stair or at the terrace level. Being an architect himself Mr. Peters says that Habitat concept is very challenging. If it is not perfect in every way, he said, that is because it is the first of its kind. "A lot was learned here about the building and housing people and that's exactly why it was built," he said. The family, of course, has not spent a winter at Habitat yet. I wish them luck and I believe they are going to need it. Last winter I toured the project with its creator, Moshe Safdie. 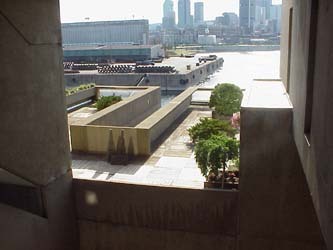 The wind was blowing in off the river and standing there in the midst of Safdie's revolutionary pre-cast concrete boxes was the coldest experience I have ever known. Safdie may have been kept warmer by his love for his masterpiece but whether or not the Peters family and other Habitat residents will generate enough enthusiasm to overcome the chill factor is another question. But the Peters aren't worried. They are having fun. The For Sale sign is up in front of their split-level home in the suburbs and, joy of joys, Anthony doesn't have to cut the grass anymore. When you pay $470 rent a month as he does for the concrete boxes he calls home somebody else handles the lawnmower. The mice? The Peters trapped 17 of them in their kitchen before wiping them out and just how a family of mice got through all that concrete is anybody's guess. 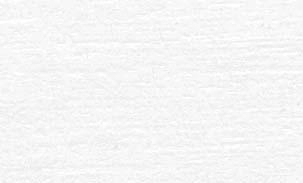 - End of article. Copyright by the Weekend Magazine, August 19, 1967. All rights reserved. "My photos of Habitat were taken at an Architectural Educators conference 5 years back (ACSA) and we had the pleasure as well of touring (and photographing) a number of the units. The owners, some of whom had lived there since 1967, were there to socialize with us. They are still very thrilled with the space. It is kind of a strange but wonderful set of spaces at the same time."